The political fuel is losing support as its costs and harm grow. WSJ.COM: It's not often that the ethanol lobby suffers a policy setback in Washington, but it got its head handed to it Friday. The Environmental Protection Agency announced that for the first time it is lowering the federal mandate that dictates how much ethanol must be blended into the nation's gasoline. It's about time. It's been about time from the moment the ethanol mandate came to life in the 1970s. The 16% reduction is a modest pullback, which EPA says will hold ethanol blends in gasoline at the standard 10% (E10). But we hope this is a precedent-setting victory. After 35 years of exaggerations about the benefits of renewable fuels, the industry has lost credibility. For years the biofuels lobby has boasted that its product was a green alternative to emissions from oil and gas. But a growing body of scientific evidence is showing that ethanol consumes so much energy and fertilizer, and requires planting so much marginal cropland, that the impact on air quality is at best neutral and on water quality may be negative. A report released earlier this year by the National Research Council concluded: "Although it may seem obvious that subsidizing biofuels should reduce CO2 emissions because they rely on renewable resources rather than fossil fuels, many studies we reviewed found the opposite." 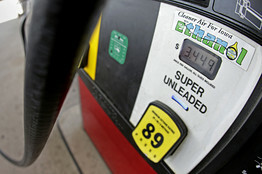 Environmental outfits such as the Environmental Working Group and the Sierra Club now oppose ethanol subsidies. The EPA reduction is a small win for consumers. Since 1978 when the first "gasohol" subsidies were enacted, renewable fuel production tax credits have drained the Treasury of almost $40 billion. The tax subsidies expired recently, but consumers have still been forced to dole out billions at the pump because of the renewable fuel standards. About 40% of corn production is now used not for food or livestock feed, but for fuel. This has raised the price of corn, and a 2009 study by the Congressional Budget Office found that in some years ethanol has raised retail food prices by 5% to 10% for everything from corn flakes to ground beef. EPA hopes to prevent a 2014 replay of the biofuels fiasco that hit the gasoline market this year. When the original levels for renewable fuel standards were set in 2007, none of the sages in Washington anticipated that gasoline demand in the U.S. would plateau as it has over the past four years, largely because of more fuel-efficient cars. This year's 14 billion gallon mandate required refiners such as Marathon and Valero to pay for hundreds of millions of gallons of renewable energy "credits" to avoid busting through the E10 blending wall. Few cars on the road are equipped to handle higher ethanol blends that can end up doing harm to engines. Despite a lack of demand, the ethanol lobby wants government to force a blend of E15 or higher on millions of consumers and force car makers to adapt their fleets to a fuel that offers less octane per mile traveled and no environmental benefit. The EPA's modest reduction is a nod in the direction of market and technological reality. But expect the lobby to fight back ferociously, and it has powerful supporters in Agriculture Secretary Tom Vilsack and GOP Senator Chuck Grassley. Democrats and Republicans who don't bow to Big Ethanol should unite to repeal the mandate for the good of consumers, business and the environment. More green lunacy, cold kills the poor as we know but taking away their food is greatly adding to their burden, and for the 'civilized' west it is unconscionable. Using a food crop to distill and hence produce ethanol to burn as motor vehicle fuel is not only the most crass stupidity. Synthetically raising grain prices and affecting all comestibles [biofuels are grown both in the EU and USA], higher food prices kill poor people in the third world and that's also a fact. A few Rupees may be neither here nor there to you and me but to a guy living on the bread line on a couple of dollars/week - 15 rps/day can mean the difference between starvation and a full belly - it is literally life and death. Food riots across northern Africa caused the inaptly named 'Arab spring' - how many deaths has the EU/USA biofuels policy been indirectly responsible for - 100s of thousands, millions? Always remember, the law of unintended consequences because the green menace never do. "... gasoline demand in the U.S. would plateau as it has over the past four years, largely because of more fuel-efficient cars." This is a punchline... right? Fuel demand has "plateaued" because the economy is in the tank and millions of people no longer have to drive to work 5 days a week. In part because phony climate science has driven regulations into overload and is crimping and killing viable business causing even less energy use.